SMARTPHONES and tablets are finding increasing uses in the laboratory, replacing the traditional lab notebook in data collection, providing a handy portable display for methods and protocols, and even becoming scientific instruments in their own right. 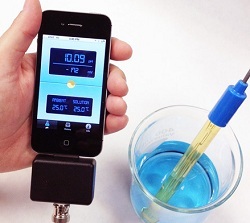 This latter application usually demands some sort of custom attachment, the latest example of which is the PH-1 accessory from Sensorex, which turns an iPhone or iPod into a versatile pH meter. The PH-1 Meter Application Accessory measures pH and presents data on the iPhone screen, and will transmit critical readings by email. It has two main components – the meter accessory which plugs into the iPhone or iPod, and the pH electrode. Users must download the software (free) from Apple’s App Store before using the device, and Sensorex hopes that in educational settings this will enable many students to share the hardware, each using their own iPhone or iPod. An iPad version of the software is in preparation and should be available late July 2012. Key advantages of using the smartphone as a pH meter include the possibility of logging readings with date, time, and GPS location. Readings can be grouped by location or date, and emailed in CSV format, with no chance of transcription errors. The PH-1 is compatible with the Sensorex S200C/BNC combination pH electrode, which measures 0-14pH with accuracy of+/-0.01pH, or the S293/30K/BNC/2.5 three-in-one electrode. This has a voltage range of -1250 to +1250mV, accurate to 1mV, and a temperature range from 0-100C. Sensorex sells the meter accessory and pH electrodes, available in four kit options,but not the iPhone or iPod. The PH-1 interface unit is priced at US$175, and electrodes range from$55 to $129. LabHomepage understands that Sensorex is considering developing an Android version, but has no immediate plans to launch any non-Apple version.